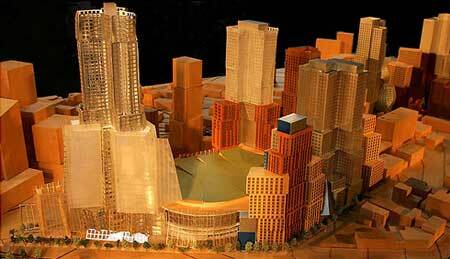 Back in December 2003, when the developer of Atlantic Yards released architect Frank Gehry's Site Plan for a glass walled basketball arena & 16 high-rise towers, its construction was treated as inevitable. But Ghery as the starchitect of record may not have been the best choice given his prideful disregard of context. Atlantic Yards is Gehry’s largest project to date, and his first stab at urban planning. Given a residential density twice that of any tract in US history Atlantic Yards is a massive social experiment revealing an architect locked into 20th Century concepts of “environment”. But clearly, in this century the idea of “environment” is expanding. At the scale of this project, and given its location within Brooklyn’s 19th Century communities, it’s now about far more than the building and spacing of brilliant forms by a hired gun sculptor architect. And it seems that time is not on Frank Gehry’s side. With tight credit markets, office space excess, construction costs increasing, housing subsidy limits, ongoing litigation, etc., Atlantic Yards may not be as inevitable as once announced. Check the Notes on Interventions page for how all this relates to sculpture and Eurasian calligraphy, and check the Links page for the project’s ongoing and unsavory details.